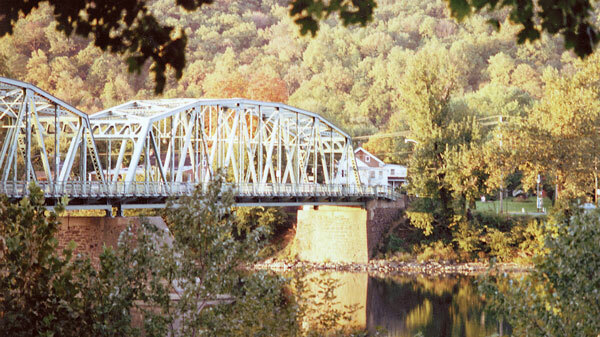 Most of the original bridge sites on our Delaware River still exist and still hold bridges. The original structures-- wooden, covered bridges-- have been replaced by steel, open-decked spans. But most of these "modern" steel river crossers have been in existence a hundred years or more, and are no longer really modern. Most are still supported by the original stone piers and abutments. What was left of Riegelsville Bridge after flood of 1903 was replaced by Roebling's Steel suspension bridge which still stands (above). The handsome Riegelsville Bridge crosses to Pennsylvania right at the Warren-Hunterdon County line, where the Musconetcong River meets the Delaware. The present structure is a unique suspension bridge, erected to replace the original wooden covered bridge. That first bridge, a typical, privately owned, toll-charging structure, was built in 1837 to take care of the business that had overwhelmed the ferries that were there first. Just four years later, in January of 1841, the bridge was hit by the worst flood of the century, and although badly damaged, was repaired. The bridge wasn't so fortunate in the next major flood, the 1903 catastrophe, which wiped out several wooden bridges on the river, including this one. 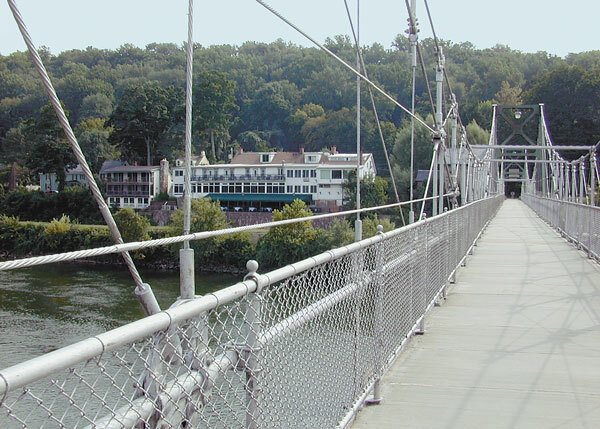 This brought the John A. Roebling Company into action at Riegelsville, and a striking steel suspension bridge constructed higher above water than its predecessor. Shortly after, the privately owned toll bridge was purchased by New Jersey-Pennsylvania Commission for the Elimination of Toll Bridges and became toll-free. When the deadly Flood of 1955 struck the valley, this bridge was one of the few undamaged in the flood. It still serves the area. You can follow the New Jersey border south along a riverside road that narrows to a one-way lane at points. Or you can cross the river here and head downriver on Routes 611 and 32 in Pennsylvania. It's just a short distance to the village of Upper Black Eddy. The original Upper Black Eddy-Milford Bridge was built in 1842, just one year after the river's worst flood also to accommodate burgeoning business that ferries alone could no longer handle. It was another wooden covered toll span, privately owned. Pennsylvania had a fine canal running along side the river here, and the bridge did a lot of business with farmers from New Jersey who shipped goods on the canal. Life was prosperous for this bridge until that disastrous Flood of 1903 arrived. The bridge, although not destroyed, lost one of its three wooden spans. But the same thing had happened to the upriver Riegelsville Bridge, and Milford bridges collected enough timber floating down from Riegelsville to repair their bridge. These repairs, unfortunately, did not modernize this bridge; old timber was used instead of new steel. On June 28, 1929, that Joint Commission for Toll Free Bridges bought the old Milford wooden bridge and, by 1933, realized that their bridge needed major repairs. Actually, only the underwater piers and abutments were saved; everything else was new and made of steel. The bridge's next test was the Flood of 1955, the worst in that century. Its deck, at high water, was 7 feet under water, but, when this water subsided, the bridge got back in business after minor repairs. Here was another survivor; it still serves the area. Staying in New Jersey and continuing downriver on the Milford-Frenchtown Road, also called Route 519, a two-mile trip, brings us into the center of Frenchtown. A quick right turn onto Bridge Street would take us over this bridge to Uhlerstown, Pennsylvania. It, like all the others, is now toll free. Ferries served Frenchtown for a hundred years before a bridge was built and opened in 1844. It was a typical covered wooden structure, but almost twice as long as the Milford Bridge. It was constructed after the severe Flood of 1841 and, because of the extreme width of the river here, dangerous high waters were uncommon. The bridge had some close calls but survived the 19th Century. Repaired Frenchtown Bridge after flood of 1903 and today's completed span. Photo courtesy Bill Lifey. But Mother Nature caught up with this bridge as it did with many others on October 10, 1903. The two spans on the Jersey side were swept away. They were replaced with steel spans but the older, wooden spans that survived this flood were not replaced. It was a strange-looking structure. 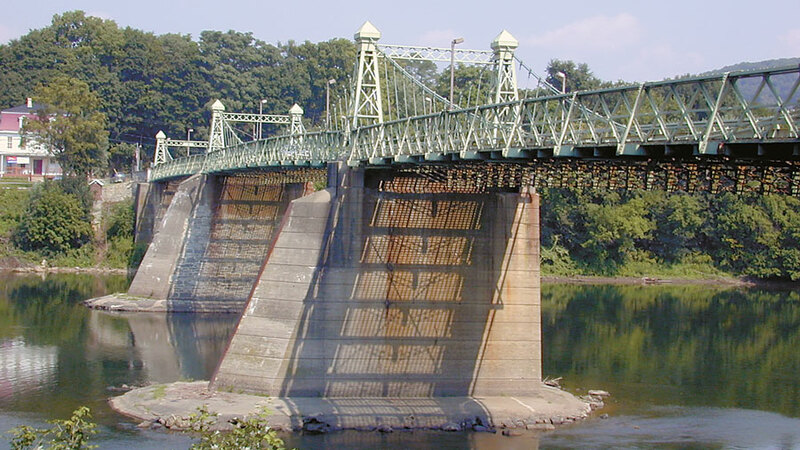 On June 29, 1929, the Joint Commission purchased the Frenchtown Bridge, cancelled the toll charges, and then rebuilt the entire structure with steel. This updating cost the Commission almost $100,000. This modernized bridge survived the Depression-- its repairs gave employment to a large number of unemployed-- but had yet to face the major Flood of August, 1955. When it arrived, the steel structure survived, undamaged. The bridge has led a good life since then and is a pleasure to see. Don't miss it. By continuing the drive downriver on the Jersey side to a quaint and most unusual bridge at Lumberville, you will pass the location of the only Delaware River bridge that hasn't survived in Hunterdon, the Point Pleasant-Byram span. It was washed away in the Flood of 1955 and never rebuilt. Another ten miles down the highway will bring you to an unusual span called the Lumberville-Raven Rock Bridge. The Lumberville-Raven Rock Bridge is for pedestrian use only and leads to the little community of Lumberville on the Pennsylvania side of the river. Visible on the bank is the renowned Black Bass Hotel and Restaurant. Lumberville is a little community on the Pennsylvania side of the river. Roads in the area are under repair now. One should reach this bridge by going down the Jersey side to Raven Rock, park the car, and walk across the river on this old span. Actually, this is no problem; this bridge is for pedestrian use only. This river span was built in 1856 in an area that never grew into a modern city. Its major industry consisted of a sawmill or two. So the bridge wasn't overworked and apparently survived the 19th century without repairs or maintenance. Then, in the Flood of 1903, it lost one of its three spans and ended up with a steel span and two old wooden ones. It went back to work. Then in 1932, the state agency purchased the mill and operated it as a toll-free span. It was during this period that its poor condition was noticed. The bridge was shut down as unsafe during World War II until peace returned, when Roebling was hired to update this old bridge. It soon opened again, but this time for pedestrian use only. And so it is today. This bridge and the little unchanged village of Lumberville still stand, are fascinating places, and make good place to stop for lunch. Another few miles downriver on Route 29 brings us to the Centre Bridge location at Stockton. The oldest Hunterdon County Delaware River bridge, it was erected in 1806, and it, too, was a privately owned toll bridge, wooden and covered. This first bridge in the county wasn't without fault. Repairs were made early in its life, and, when the flood arrived in 1841, three of the bridge's six piers were swept away. The busy bridge was promptly rebuilt, better than new. In 1852, plans were made to convert one of the two lanes on the bridge to a railroad track. Fortunately, the deal fell through and the railroad never used the structure. Further south, the Trenton Bridge, built for horse-drawn wagons only, lived a short and incompetent life as an adapted railroad bridge. The Flood of 1903 did not do any serious damage to the Stockton bridge but later, in 1923, the old wooden structure caught fire twice in the spring. Then, in July of the same year, it was struck by lightening and burned almost totally. No repairing was done for two years. Then the Joint Commission took over the remnants and built a brand new steel structure, raised well above the potential flood level. In the forthcoming Flood of 1955, it was untouched, This is the handsome and busy structure that serves the area today. The last stop down the river, just 4 or 5 miles below Stockton, is Lambertville, home of a very early bridge and location of a very disastrous bridge experience. 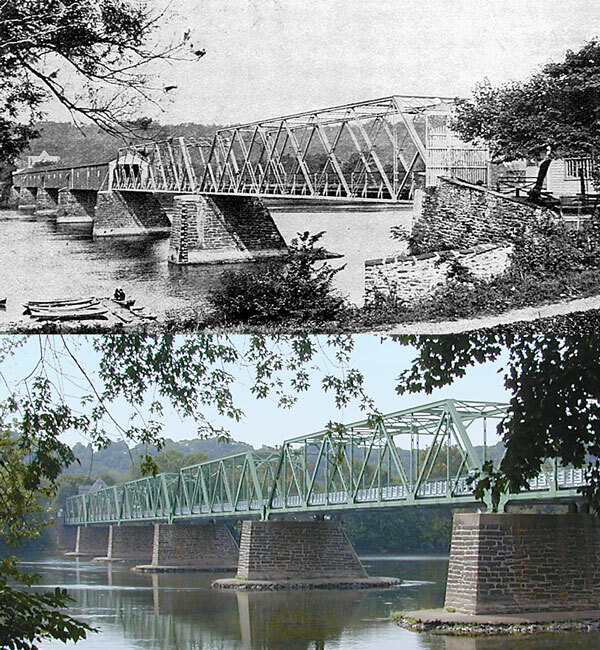 The New Hope-Lambertville Bridge opened only a few months after Centre Bridge. The bridge's design and building material were similar to other bridges at this time. Its designer was Lewis Wernwag who had an excellent reputation as an innovator. But after the bridge was built it was put in other hands. The early and serious problems involving the bridge were not caused by Mother Nature, but, rather, by human nature. The early bridge corporation was allowed to serve the area as the only local bank, and the owners paid more attention to the interest rate they could charge than to the efficiency of their bridge. Bridge tolls were often, illegally, used for outside investments or insecure business loans rather than the maintenance of the bridge. The bridge company began to suffer financially because of its banking. In the 1820s it could not meet its payments on the bridge's mortgage and, instead, paid with an IOUs. Then, a severe depression took place, called the Panic of 1837, which hurt the bridge financially. Then these financial losses were greatly increased by the cost of damage repair in the Flood of January, 1841. After years of continuing financial struggles, a new company finally took over in 1887. The new owners were not in the banking business, but Mother Nature entered the act. On October 10, 1903, the new century brought another flood, this one destroying all of the wooden Lambertville structure. A brand new, all-steel, bridge took its place. Then, in 1919, the Commission for the Elimination of Toll Bridges purchased the bridge and permitted the poor civilian owners to retire. The new bridge lived a good life and was kept in good condition, but then, in the flood of August 19, 1955, calamity threatened. Damage was done but nothing was destroyed. After only a month of repairs, on September 22, 1955, the bridge was opened again. Since that time, it's been almost half a century, the new steel structure, one of the longest on the river, has served the area with pride and distinction. When your Hunterdon bridge trip is over, getting home is just as beautiful. If you're heading west, cross the Delaware at Lambertville and turn right on Route 32 on the Pennsylvania side; go upriver through some unforgettable scenery along the river, most of the way. But be sure you're aware of current road closings. 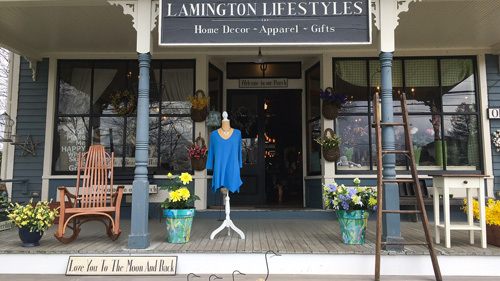 Heading east you can take Route 179 or 202 out of Lambertville across beautiful farm country towards Ringoes and Flemington. Bon voyage! If you like bridges and anything about the Delaware River, you'll love Frank Dale's book, Delaware Diary. 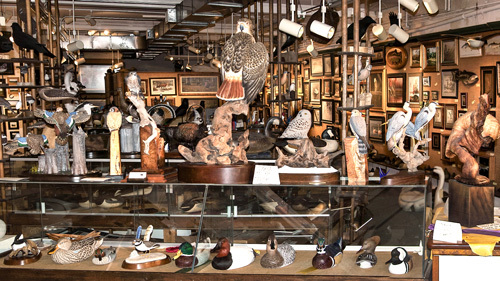 This wildlife art gallery contains the area?s largest selection of hand carved decoys, representing carvers across the US, as well as an extensive collection of original paintings by some of the nation's most renowned artists. Delightful fantasies beyond words! 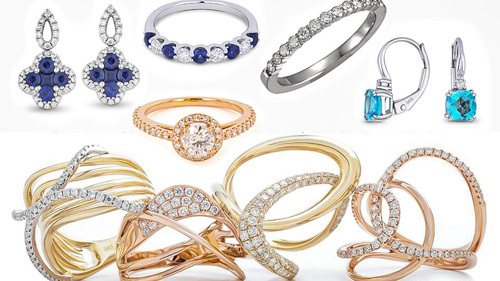 Gold, Platinum & Silver Jewelry, Wildlife Photos, Crystal, Lighthouses. Perfume Bottles, Santas, Witches Balls, Oil Lamps, Paperweights, Chimes, Art Glass, Wishing Stars. Now featuring Pandora Jewelry.